With the return of warmer weather, the focus of outdoor activities is shifting to pursuits where the partakers can maintain a comfortable temperature personally. So logically this means taking advantage of the local water resources. North Florida’s coastal counties have a wealth of aquatic assets which can be enjoyed all year long, but spring and summer provide some exceptional opportunities to indulge. While literally submerging in this liquid delight all sorts of creatures can be encountered. An overwhelming majority of these beings are harmless and benign to humans, and many are curiosities which can provide hours of entertainment. Starfish are one of these lifeforms which is commonly encountered in salt and brackish waters. Starfish are members of the echinoderms phylum. The ancient Greek based word literally means hedgehog skin and reflects the rough exterior of these marine dwelling animals. Other members of this grouping which can be found locally include sea urchins and sand dollars. In all there are about 7,000 individual species worldwide in this phylum with exclusively marine members. Starfish are found in shallows as well as great depths in the oceans. They are one of the few creatures found in the lowest points of the deep sea providing an important service to the overall salty system. Depending on the individual species, starfish extract sustenance from a variety of sources which support their existence beneath the waves. Some live on the byproducts and scraps left over from other creatures and utilize waste materials which could otherwise accumulate and become a breeding ground for problems. Other starfish are carnivores, actively hunting and preying upon marine invertebrates. These target species are usually bivalves, those mollusks like scallops and clams with a pair of shells which use a hinge to control opening and shutting. Once the meal has been identified the starfish envelopes it with its arms. Securely attaching its tube-like feet to the mollusk’s exterior, it applies pressure in an attempt to open one side of the unlucky bivalve. When a small gap is opened between the shells, the starfish projects part of its stomach into the bivalve. Digestive enzymes are injected which results with the mollusk’s tissue dissolving. With the meal subdued and compliant, the starfish syphons out the remainder of its dinner. Then it is on to the next opportunity for a snack. While looking for feeding opportunities, starfish can become the menu choice for other sea creatures. These potential predators include crabs, seabirds, fish and other marine animals seeking a nutritional option. One defensive strategy of starfish is to sacrifice an arm which will satisfy the pursuer and allow the starfish to escape, somewhat worse for the experience. Luckily the starfish can regrow the missing limb with few long term ill effects, but the arm is noticeably shorter immediately after the ill-fated experience. Indirectly, starfish have been geologically significant. The high concentrations of calcium in their skeletons are thought to be a significant contributor to limestone deposits created over the eons of time. Fortunately, spring beach-goers need only be concerned about the occasional starfish in the shallows which provides an alternative to the empty sea shells. Likely some of those shells helped sustain the local starfish population. 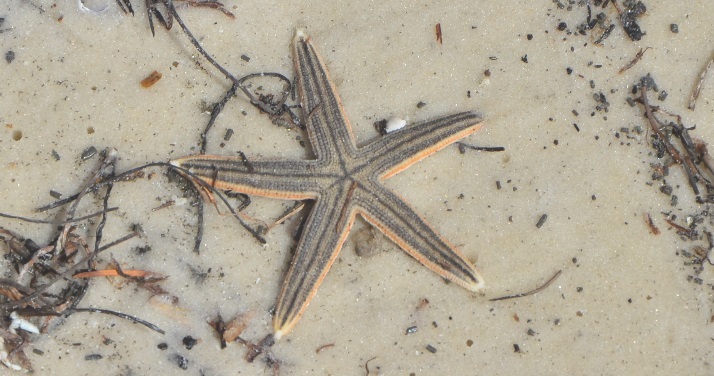 To learn more about starfish found in panhandle Florida’s costal waters, contact the local UF/IFAS County Extension Office. Click here for contact information.